Most of this is a re-post of an earlier item — but we had to change the date because of a conflict. The new date for the July meeting of the Federal News Radio Book Club is July 31 at 2p ET on 1500 AM and FederalNewsRadio.com. It is listed below, but… We will be joined by White House chief technology officer Aneesh Chopra… and the book he selected: Payback: Reaping the Rewards of Innovation by by James P. Andrew, Harold L. Sirkin, and John Butman — and James Andrew, Senior Partner & Managing Director of Boston Consulting Group’s innovation group will be joining us. I’ve just finished the book and it is a fascinating read about how to make innovation a part of your organization. While the book is mostly written from a private sector perspective, but there are all sorts of applications for government. And I know Chopra will talk about why he believes the book applies to government. Reminder: Friday, July 31 at 2p ET. We have also created a Facebook page on the Federal News Radio Book Club “meeting.” We’d love to hear your thoughts and questions about the book as you read it. 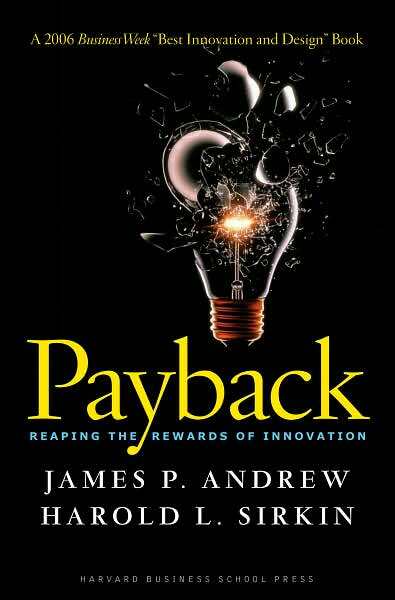 The book: Payback: Reaping the Rewards of Innovation by James P. Andrew, Harold L. Sirkin, and John Butman — and James Andrew, Senior Partner & Managing Director of Boston Consulting Group’s innovation group will be joining us… so not a bad line-up: Chopra, Andrews and then Rose and Dorobek.